Mothers Day Gifts: Shari's Berries $50 Giveaway CLOSED! I dont know about you but this mama likes her chocolate! And what is even better than chocolate you may ask? Chocolate covered berries!! Oh and chocolate truffles!!!! Yes those are the weakness of my chocolate cravings. I know that when my husband gets me some chocolate covered berries or some truffles, he cant go wrong. One site that we have found and I have shown to him, and told him what I would love to have is Sharis Berries. You can get chocolate covered berries, chocolate covered goodies and chocolate truffles delivered. A little way of telling that special mama in your life that you care. These are the type of goodies that I can enjoy in a nice hot bath with a glass of yummy wine, with the lights out and the candles lit, and oh yeah, no kids!!! The goodies from Sharis Berries are the perfect me time goodies, that you can savor and just get lost with! I was sent a box of 36 assorted truffles to review, courtesy of Sheri’s Berries. 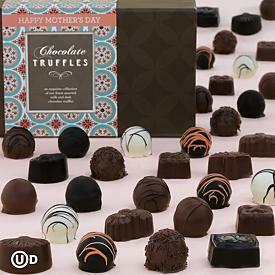 These Mothers Day Chocolate Truffles are so delectable and oh so yummy! I have shown my husband the hand dipped strawberries that I would love to have for Mothers Day, and I look forward to his gift to me!!! This Mothers Day when you are looking for that perfect gift for the chocoholic in your life, head over to Sheri’s Berries and select the perfect gift from the amazing selection of chocolate goodies they have there!! To help you in your selection, the wonderful people from Shari’s Berries would like to give one of my amazing readers a $50 gift certificate this Mothers Day!!! Like Shari’s Berries on Facebook, then come back here and leave me your email with this entry!! Previous Post Mothers Day Gifts: Tassimo Brewer Giveaway CLOSED! Next Post Mothers Day Gifts:$50 Novica Gift Card Giveaway CLOSED!! I follow you on GFC as bikeohio.